Fashion | Beauty | Body Positivity | Lifestyle | Pop Culture: Street Style Inspiration: NEON!!! For years fashion has been influenced by two walks of life: runway and red carpet. But not any more. Thanks to a new breed of fashion icons-Street Style Fashion Bloggers- we now can turn to the ‘real-way’ and get inspired. 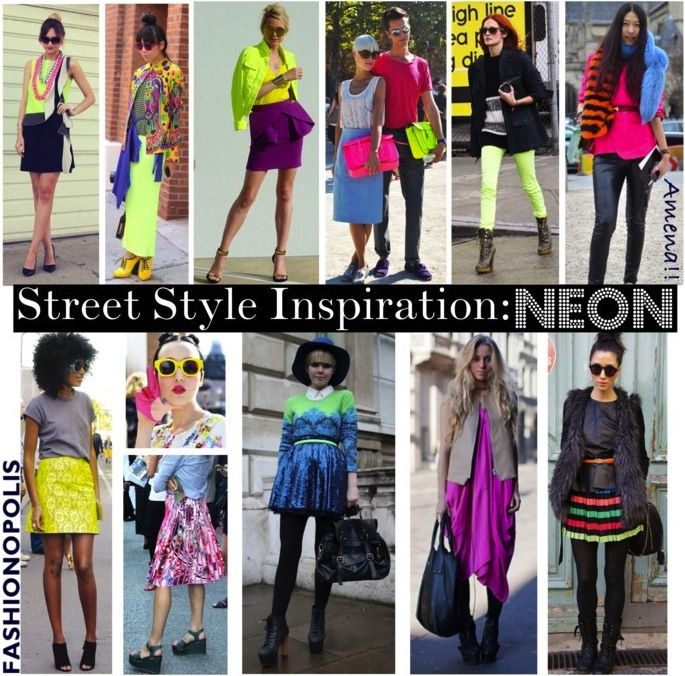 For my first street style inspiration I choose neon colour trend. You ask why neon? Well, the streets of fashion have been literally glowing neon. In varying degrees of brightness and boldness, neon colours have been making quite a regular appearance from NYC to Milan and all the other fashionable cities. Plus, it's one of Spring-Summer 2012's major trend. How could a die hard colour lover like me stay away from these gorgeously vibrant shades? I just had to do a neon post! Lets face it; neon colours are not for the faint of heart. They may look effortlessly chic on our fave fashion bloggers, but in all honestly they require little bit of guts and whole lot of panache to pull off the look. Otherwise one may end up looking like an 80’s back-up dancer! Like me, if you too are new to this trend; but nevertheless tempted to try it, here are a few tips for styling neon colours. Choose Correctly: First off, you need to pick a color you are most comfortable in, as well as the one that suits your skin tone. Start Small: First timers can start by picking neon accessories or jewelry. You can add a neon belt or bag to your classic white top and blue jeans look. Or spice up your LBD with a neon pumps or scarf. Hints of Neon: Clothes with neon accents are a great way to experiment with this trend. Dress with neon piping, or shoes with neon straps or a top with neon motif, is a great way to start.This way you get to try out a new trend without stepping out of your style comfort zone. Balance is Key: There are those who can carry off a head-to-toe neon look, for the rest of us it’s all about balancing the color palette. You can choose one single statement-making, eye-popping neon piece and pair it with classic black and white or grey or neutrals. Highlight your Assets: Nothing says all–eyes-on-me quite like neon. We all have one (or more) asset we very proud off. Neon gives you a perfect opportunity to flaunt them. Got amazing legs? Show them off in a pair of neon skinny jeans. There is no one rule for wearing neon colours. While some street style fashionistas have colour-blocked it, the others have chosen to only accessorize with it. Depending on your style preferences, you too can rock a neon look of your choice. Well then ladies, are ready to glow neon bright? And what look would you go for? Share your and opinion with me in the comment section. Thank you so much Purushu. Thank you sweetie. I too am lusting for a gorgeous neon bag. I too love this trend. Hope you find your neon piece. Thanks for stopping by. I like to try neon via accessories - bags, bangles and shoes! 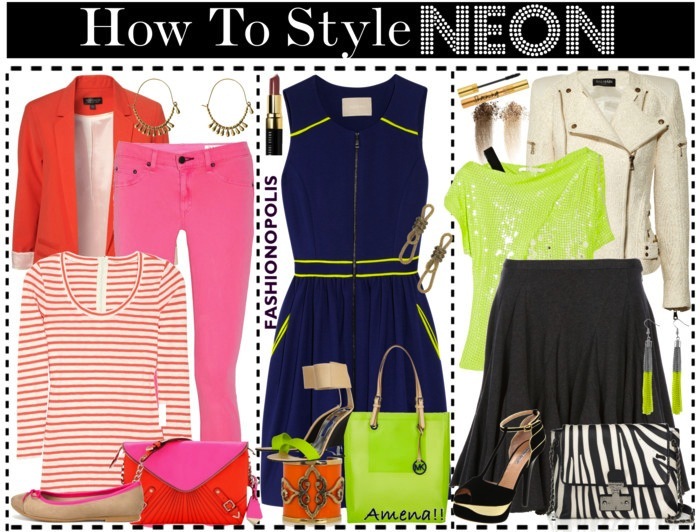 Lovely post and great tips to style neon! Hope you are having a wonderful day! Jyoti, thats exactly how I am adding neon to my outfits. Via accessory. Hope you have a lovely weekend. Great tips! Neon certainly takes guts and I'm willing to give it a shot! Thanks. I am sure you will rock the neon trend. great tips..personally, i don't know if i will give in to this trend. but if its little things like belt or hairband..then why not! Very nice post . inspires me to wear neon. Thanks Sarah. Me either, I would never do a head to toe neon, ever!!! Thanks Rudy for your kind words and recommendation. Hope you have a wonderful day ahead. love all the streetsyle pictures you've picked! Thanks Alexandra. I somehow could not visit your blog. It says I dont have access. Would love to visit it. Great post! Love the neon touch! love the tips on wearing neon!! I like how you created three looks with different degrees of neon. My favorite of the three is the blue dress with the neon green trim. A great way to dip your toes in the trend before diving in! Thank you Jennifer. I too would go for the second look myself, till I get some courage to go all neon-out. I like colour a lot. And colour likes me. Any bright colour around my face will compliment me. Very odd. i am already 58 so I have to be really careful with this look. Nothing as ugly as an older women trying to look young. I very much like the first left photo of the smart yellow top with black and white trimming (scarf?). She added another colour with her pink bold necklace. Have to remember that. Easy and low cost. And i adore the third photo from the right, top row. The yellow with purple. Have to adjust that though, like with a longer pencil skirt. I personally believe there is no age for color. The first left outfit is a dress by DVF. I am sure you would look amazing in any of the look you want to try out. Thanks for stopping by. I love that pink denim! Too cute! Love all things neon- thanks for sharing such a great post! Thank you so much for your kind words and visit. Great post...lovin' neon right now! !